Back of the Cereal Box: Ain’t It a Nef? Things you learn at LACMA: Art is neat. The museum grows every time you avert your eyes from it. And there’s a Paul Klee painting of a pear that, when viewed from the right angle, seems to contain a hidden image of the Virgin Mary in style of the Gelflings from The Dark Crystal. Also, if you are me, you learn the word of the week. 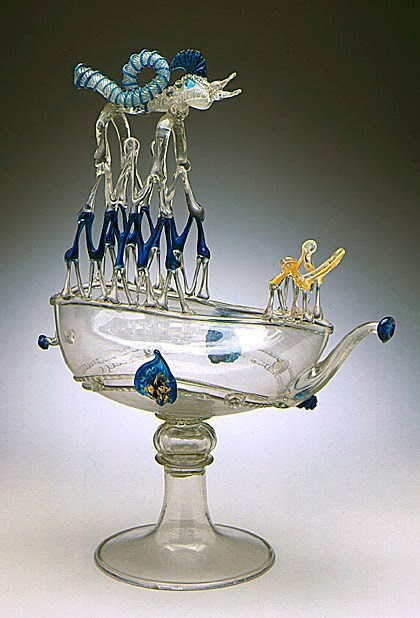 nef (pronounced just like you’d think) — noun: an ornamental vessel used for the decoration of the table, having a form resembling a ship of the Middle Ages. Certainly decorative. Clearly boat-shaped. Also, fragile enough that I should never adorn the tables of diners prone to emphatic hand gestures. This word does not have a particularly convoluted etymology. Most sources simply cite that it comes from the French nef, “ship,” which in turn comes from the Latin navis, the Greek naus and all the way back to the Proto Indo-European root nāu-. One blog identifies nef as specifically Middle French, with the modern French word for “ship” being navire. And Wikipedia claims that nef was also an alternative name for the carrack — a four-masted ship of fifteenth century that, confusingly, was also known as the nau. I’m always happy to learn that a word a word exists for something so specific, and even more so when the word sounds so strange. I mean, given the above example of a nef, doesn’t the word sound inappropriately caveman-like? As far as being rare and specific, however, nef reminds me of a word of the week that I used sometime back, toby, a drinking mug in the shape of an ugly guy with a tricorn hat. I wonder why those who specialized in the dinnerware arts have been so successful in coining words. The Wordnik page for nef — which, by the way, points out that nefs were sometimes used to house dining utensils, especially those belonging to the lord of the house — pointed me in the direction of another word: cadenas, a holder for utensils and spices that wasn’t necessarily shaped like a ship and wasn’t necessarily for the head of the table. However, I can’t imagine the nef I saw at LACMA being used to hold anything, since it seems like the slightest touch could reduce that beautiful glass structure into beautiful glass shards. At least by the museum’s standards, nef can be used to name an item that serves an aesthetic purpose only. Nef isn’t a word that anyone really needs to know, unless you’re the guy who writes museum placards , I guess. But it’s worth pointing out that a similar and possibly more familiar word exists. Nave — “the main part of the interior of a church,” usually where the congregation sits — also comes from the Latin navis, probably because the church feature resembled a ship. there many rare words in this planet, in fact many of you put in here is the the first time that I see it, holy cow!!! what is "zenzizenzizenzic"?